TORONTO, ON – Amsterdam Brewery has announced the return this week of a limited edition beer brewed in collaboration with Toronto craft beer destination Bar Hop. Foreign Extra Stouts were traditionally brewed with a extra hit of hops to help preserve freshness as the beer travelled by ship to colonies around the world. This style of beer may be hop forward in its production but by using roasted barley and malt, a deep and rich beer with a slight dryness results. Foreign Extra Stout is a exciting beer to drink and one not often brewed by local brewers. It’s very drinkable at 6.5% with a distinct character that continues to build with each sip. 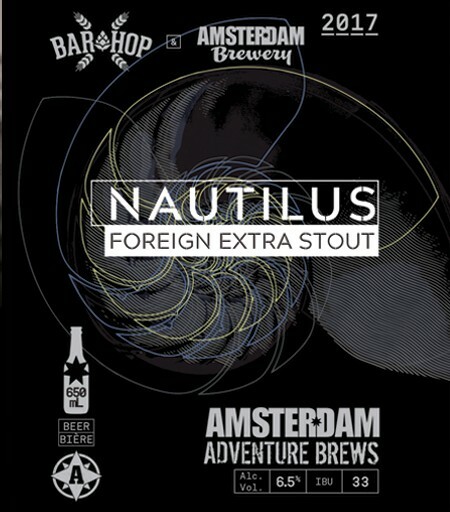 The new batch of Nautilus will make its debut tomorrow (Thursday February 2nd) at 5:30 PM at the original Bar Hop location (391 King St. W.). A limited run of bottles will go on sale the next day at both Amsterdam retail stores.